Is the Korean Skincare Routine Right For You? Last year, I did an article on Korean beauty or K-beauty as it's known on the internet. Beauty trends come and go and one that is really popular right now is what's known as the Korean Skincare Routine. Just what is the Korean Skincare Routine and how does it differ from other facial skin care regimens? Let's learn more about this multi-step trend that has a cult following. I am putting it to the test myself --following the steps for 30 days. I am going on week 3 and I think I am hooked. I think that you really have to be open to something and not just dismiss the idea because it goes against what you're taught in esthetics classes or at the American cosmetics counters. Just like we have adopted many techniques from the French in terms of beauty, we really can learn a great deal about self care and pampering from the Korean skincare routine. There is a great emphasis on prevention versus correction. At a young age, women in Korea are taught to take good care of their skin, often heading to bathhouses with their mothers. It is cultural to invest time and energy into the art of a skin care routine in order to keep skin looking younger longer. By contrast, in the United States, women are generally more likely to take the minimalist approach with their daily regimen. In the US, trends indicate that we do not typically to stick to a consistent routine until we begin to notice subtle signs of aging. There are ten steps, to be exact. Ten. It is truly a ritual -- and that is its appeal. The idea is that a lengthy (typically 30 minutes) routine helps pamper and nurture your skin. Says esthetician and Korean beauty expert Charlotte Cho: "It’s the lifestyle and mindset behind skin that’s really getting people interested in Korean skin care rituals." 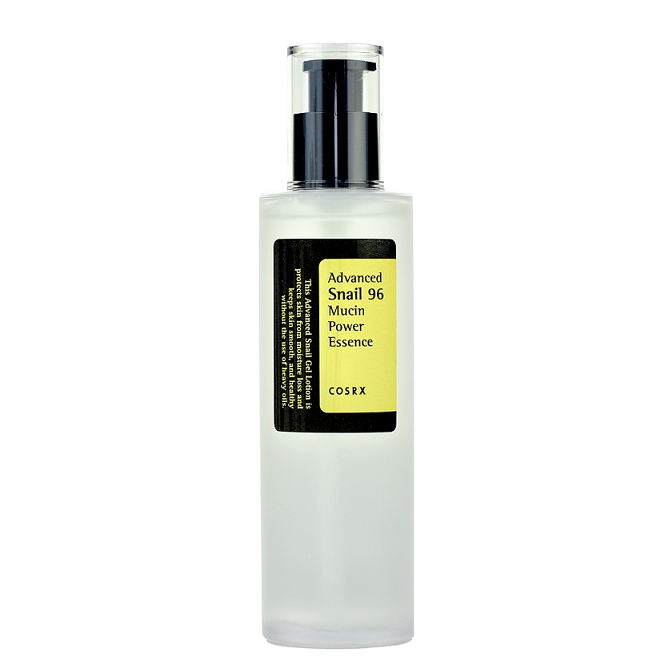 Cleansing oil dissolves makeup and remove environmental debris. Massage into face and neck, add a splash of water in order to emulsify the oil, and repeat. I am using The Face Shop Rice Water Bright Light Cleansing Oil. I like it more than face oils from Josie Maran, Sunday Riley, and DHC. Foaming cleanser is used to remove all traces of makeup and other impurities left behind after step one. Following an oil cleanser with a water-based cleanser is known as the “double cleanse” method that is one of the hallmarks of the Korean skincare regimen. 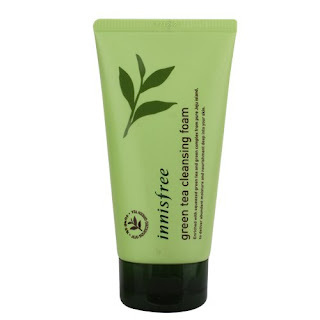 I cannot say enough about Innisfree Green Tea Cleansing Foam. I absolutely love how soft and creamy it is. 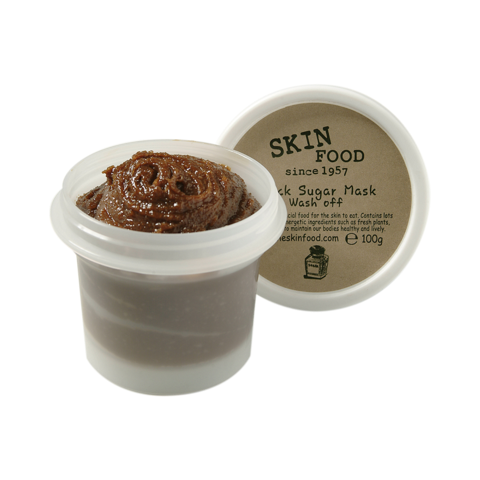 It gently lathers and removes last traces of makeup and cleansing oil. It is the best foaming cleanser I have ever used. Exfoliation is the third step. This step should be done once or twice a week and allows dead skin cells to be sloughed off. It is, perhaps, the most crucial step, as a clean face allows treatment products to absorb more readily into the pores. In other skincare routines, we tend to focus on chemical exfoliants like glycolic acid. A good old fashioned manual scrub is the norm in the Korean routine. I use the Skinfood Black Sugar Wash Off Mask. 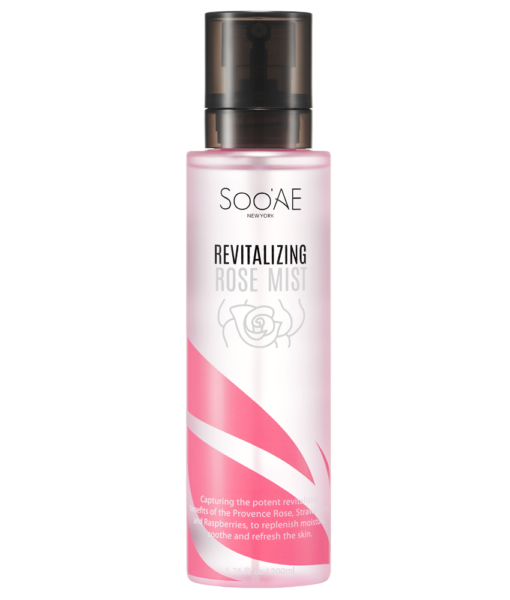 Toner is applied to assist in restoring skin pH and helps to rehydrate the skin. Think of it as somewhat of a liquid primer for the skin. A makeup primer creates a smooth canvas with which to apply foundation and, similarly, a toner creates the right canvas for serums and masks. We traditionally use a cotton pad to apply toner in the US, but in Korean skincare, it is often applied with the fingertips. I spritz mine onto my fingers and gently massage into skin. There is less waste this way, too, I am finding. I am using -- and loving -- Soo Ae Rose Revitalizing Rose Mist. Essence is a lightweight, less concentrated product used before a serum and is considered to be the core of the Korean skincare routine. Think of essence as a toner-serum blend. 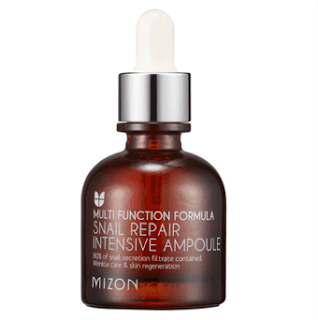 Apply this skin repairing liquid into the skin with your hands and gently pat in. My favorite? CosRX Advanced Snail 96 Mucin Power Essence. Serum is applied after essence and it known as “ampoule” in Korea. It is highly concentrated and is the skin pefecting step. In this skincare regimen, your choice of serum is based on your key concern, whether it be congested pores, lack of brightness or fine lines. I alternate Mizon Snail Repair Intensive Ampoule with Elizavecca Witch Piggy Hell Pore Control Hyaluronic Acid Serum, which is 97% hyaluronic acid. Sheet mask follows a serum. Unlike the masks we are used to in the United States, a wet, paper-like mask is used. This step is relaxing and takes a bit longer than the other steps, as it is on up to 15 minutes. Sheet masks can be used every day of the week if desired. I LOVE my sheet masks and they are so relaxing -- and budget friendly. 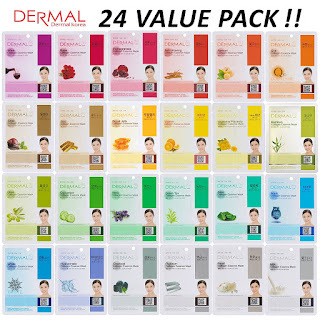 You can find the Soo Ae brand of sheet mask at Wal-Mart for $2.50 or you can order a giant pack like I did -- 24 masks (ALL different) from Amazon for under $14. 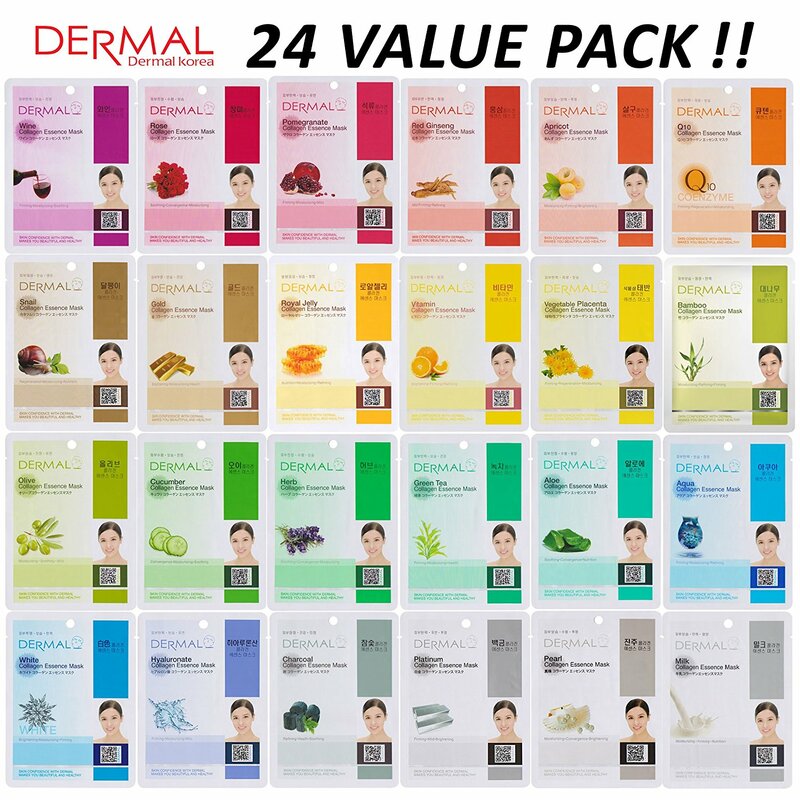 The brand is Dermal Korea Collagen Essence Full Face Sheet Masks and I LOVE these! 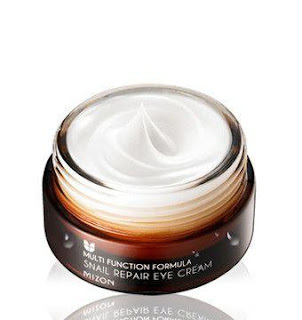 Eye cream is a twice daily must. As the skin under the eyes is thinner than an eggshell, it is quite fragile and lacks hydration. A rich, nourishing cream formula is what is advised. 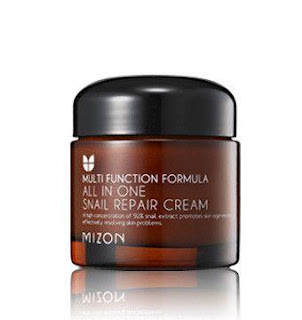 My new favorite is also from Mizon and it is the Snail Repair Eye Cream. Moisturizer to help skin seals in the previous steps and leaves the skin looking plump and dewy. Whether you prefer a lightweight lotion or a rich cream, be sure to look for one with hyaluronic acid to help avoid water loss. 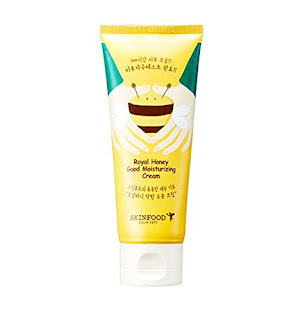 I use Skinfood Royal Honey Good Moisturizing Cream, which is really lightweight and non greasy, in the morning and Mizon All-in-One Snail Repair Cream at night. Sleeping Packs are used as the very last step at night. They can be used as little as one night a week or nightly if desired. I have two that I use and for different reasons. 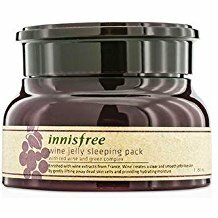 Innisfree Wine Jelly Sleeping Pack smells like a glass of cabernet. I use this one once a week, as it is very hydrating. I know I will be using it more frequently when winter comes. You apply this -- I use a dime size amount for my entire face and neck -- in a thin layer over all of your other products. 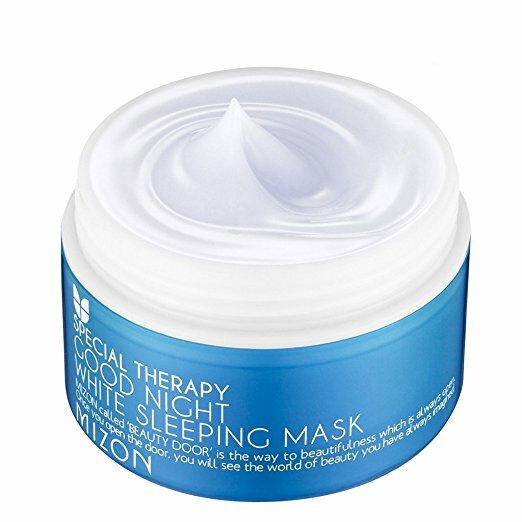 Since nighttime is best for cell regeneration, it is an ideal time for your sleeping mask to work its magic. It isn't a mask per se, as it doesn't harden or get peeled off. It is almost like a gel-like cream. This particular one is full of protective antioxidants, polyphenols, and contains the anti-inflammatory and exfoliating benefits of mandarin peel extract. The sleeping pack that I use three nights a week is ULTRA light and non-greasy and contains natural ingredients that are believed to treat hyperpigmentation spots and melasma, which I have. It is the Mizon Good NIght Whiye Sleeping Mask. Don't let the "whitening" in the name scare you. It contains mulberry and paper mulberry extract and a large amount of niacinamide, which is anti-aging and said to help fade spots linked to melasma. I can see that spots are lightening ever so gradually. My skin is also brighter after each use. Sunscreen in the morning is non-negotiable in any skincare routine, but it is emphasized even more so in the Korean skincare routine. It is the very last thing to go on the skin and should be used every single morning -- whether it be cloudy and dreary or sunny and bright. Look for a product with broad spectrum protection to help prevent UVA and UVB damage. 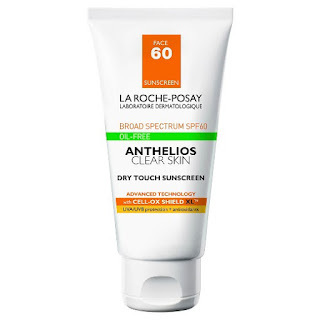 A non-greasy choice for the face is La Roche Posay. It is not a Korean product, but it is one I love and swear by and since SPF is so important, I am sticking with it right now. The one I use (*gifted by Influenster) is the La Roche Posay Anthelios Clear Skin Dry Touch Sunscreen SPF 60. Are all these steps really necessary? Here's my take: I have been in the skincare industry now for more than half of my life. I believe that taking preventive measures -- beginning a solid skincare routine with potent vitamins and active ingredients -- is really important. I believe that as a culture, we are always busy and in a hurry. This aspect of our lives tends to carry over to our skincare, doesn’t it? We rush. We skip steps. We opt for fast over thorough. Sometimes we "forget" or our too tired to take off our makeup at the end of the day. Other times, we go a couple weeks without exfoliating, thinking "What's the big deal?" In that regard, I really think that the aspect of taking a break to sit back, relax, and truly pamper ourselves is really important. I used to be rather skeptical of this routine thinking that it was nothing more than a ploy to get you to purchase more products. I was apprehensive about so many steps and the likelihood that it might irritate the skin and clog pores. I have come to really realize that the way we are accustomed to here in the United States isn't necessarily the only way, the right way or the best way. We rely on what we are taught in esthetics and cosmetology classes, in magazines, and in the latest fads. I was TRULY a skeptic going into this. Following the Korean skincare routine has become a marvelous self-care ritual for me. 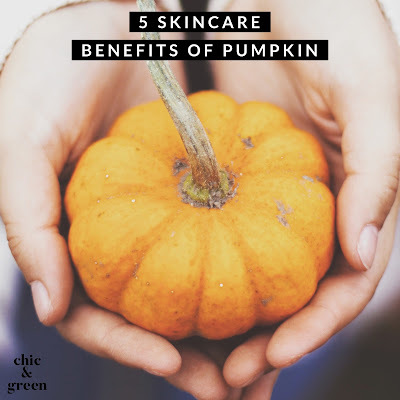 No longer a skeptic and no longer relying solely on my training and "this is what the dermatologist recommends", I went into this with a completely open mind and have found that the Korean Skincare Routine, for me, lives up to the hype. I am two and a half weeks in. I find that my skin is brighter, more even toned, and that my hormonal acne has lessened. I have not gotten one new pimple. The one whitehead I had is shrinking. I am taking TIME FOR ME, which is something I don't often do. I look forward to this ritual -- it really only takes about 10 minutes when I don't do a sheet mask, but I feel more relaxed before bedtime when I wind down, apply a mask, and just BE. Is this routine for everyone? It may not be. I am converted, though. I will also say that Korean beauty products are quite affordable compared to their American and French counterparts and you can find many on Amazon -- check packaging, reviews, and inquire about expiration dates if they are not listed. The links I have provided will get you the same authentic products I am using. The entire routine personally cost me just over $100 for ALL of the products (sunscreen was free from Influenster). A non-Korean serum alone can run you that price here. Another note - Korean skincare products tend to feature more actives and a higher concentration of beneficial ingredients. That $50 "niacinamide" cream here in the US might contain niacinamide as the LAST ingredient, while in Korean products, it is near the top. So for bargain hunters wanting STELLAR ingredients, you too will likely be happy with the prices you see! Have you tried K-beauty? What were your results? 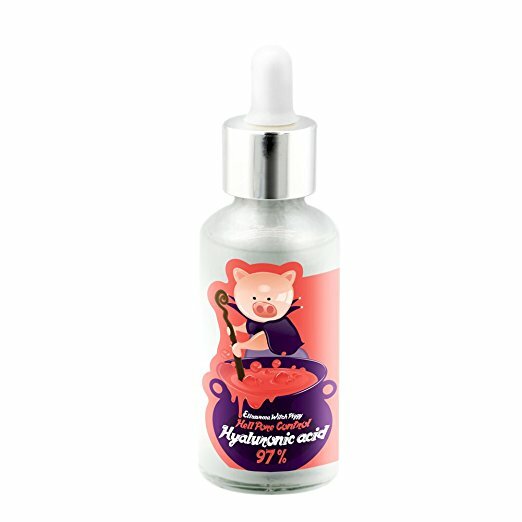 Your favorite products? 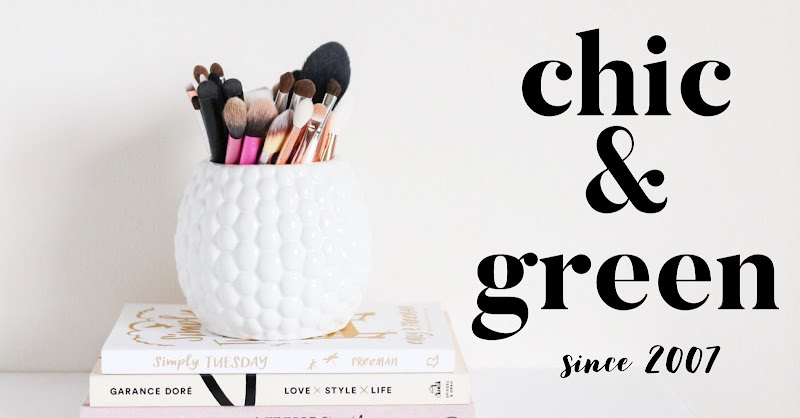 Stay tuned here to The Beauty Writer, as I will be posting lengthier, separate reviews for most of these products, as well as photo progress for you to see from day 1.